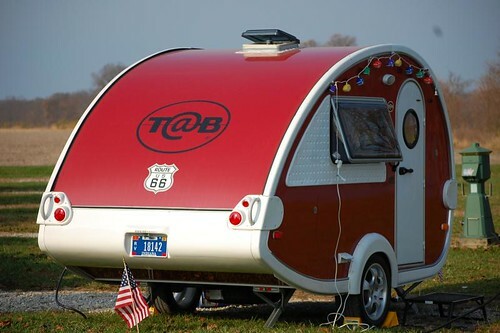 If you would have told me three months ago I’d be the owner of a travel trailer in early December, I likely would’ve looked at you, tilted my head, and would’ve said “Huh?” Well, it is true, and I’m quite happy I own one, a 2010 T@B TQ. We bought this little guy in September after a series of events transpired on a Route 66 motor tour we were on in Missouri. We have no regrets after purchasing our T@B. We’ve had 5 camp outs in it, met some great new T@B friends, and have even spent numerous nights “driveway” camping. We’re hooked and there’s no turning back! 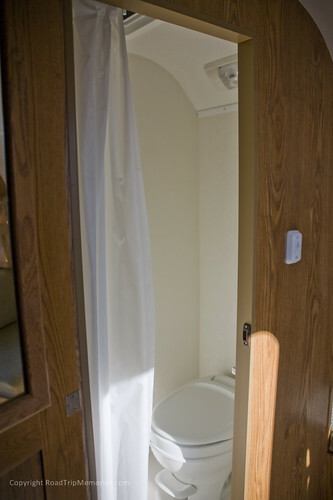 After camping out a few times, we realize whatever our next trailer would be, we want something with a shower/potty combo. 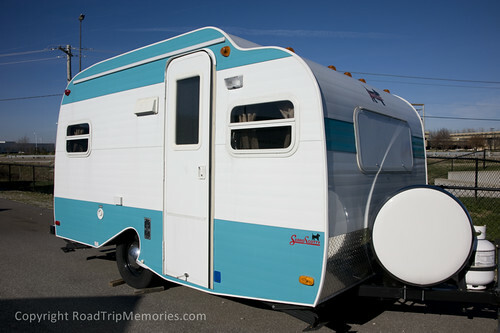 We found a few small trailers on the market and like the longevity of the Casita. But there was one issue I had with the Casita that I’ve been having trouble getting over. My apologies to Casita and its owners, but this thing to me is just ugly! After having the cool looks of the T@B, it would be hard for me to own this. Make no mistake, I have the utmost respect for the Casita and their longevity. But the T@B just has that “Wow” factor. I would have settled to have one if that’s all there was in our price range, but fortunately something else came along that met all our requirements. It has the shower/potty combo, it has retro styling, and it’s got the “Wow” factor. It is the Serro Scotty HiLander. Serro Scotty was a company that began producing small “canned ham” trailers in the late 1950’s. 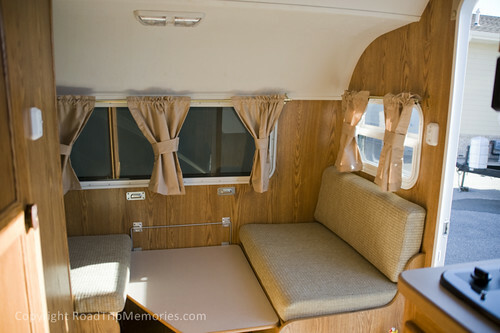 After a fire at their Pennsylvania plant in 1997, they got out of the RV business and focused on, ironically, building mobile fire safety houses and are now known as Mobile Concepts by Scotty. 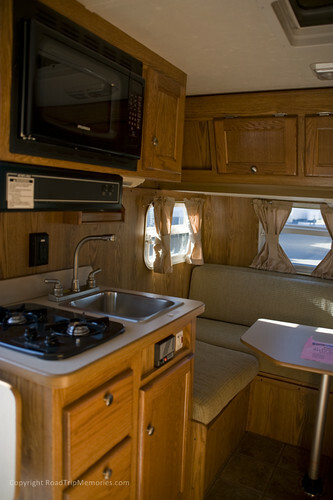 In 2006, an RV dealer in Pennsylvania, Bill Kerola, purchased the rights to the Serro Scotty name and began having a few of the more popular Scottys from the 1960’s reproduced, retaining much of the original look, but with 21st century technology. We took a trip to Collinsville, Illinois to an RV dealer there who sells the new Scottys. We were very impressed with a number of things with the HiLander he had for sale. It appeared to be constructed quite well, the oak cabinets were put together well, it had a nice amount of usable floor space, it had a nice amount of head room compared to our T@B, the shower/potty combo looked ample, and oh yeah, it had that “Wow” factor! We’ve learned the new Scottys are being produced by Sierra Motor Corporation in Bristol, Indiana that makes living quarters for horse trailers. Jennifer talked to Tom at Serro Scotty Worldwide, the general manager, and he did a fine job answering all the questions & concerns. 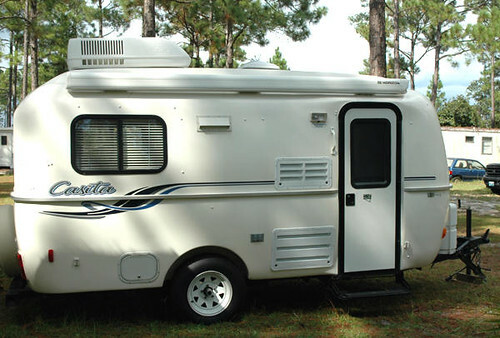 So…it looks like we’re going to make the commitment to get a HiLander for our camping adventures. Ahh, but one issue first: We have to sell the T@B. We’ve begun the process with an ad on Craigslist. We’re not too worried if it doesn’t sell right away, as we don’t feel there’s a big rush. But, we’re really getting excited about one day getting the HiLander. And we’re pretty sure we’ll hang on to that one longer than 3 months.